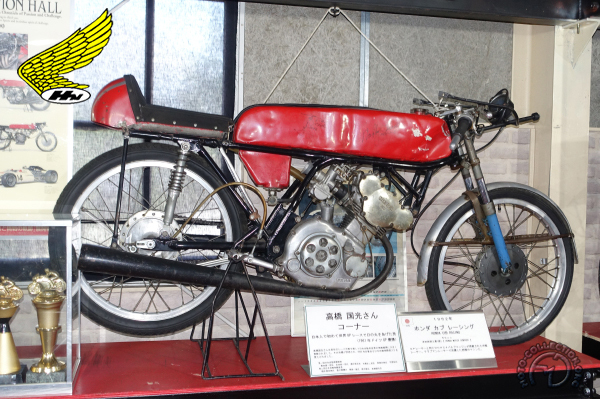 In 1962, Honda, which already dominated Grand Prix racing with its 125 and 250cc fours, attacked the 50cc class with a superb single-cylinder four-stroke. It had twin overhead camshafts, 16 valves and eight speeds. Its compact power unit was suspended from a tubular frame. Roadholding was the equal of its top rivals. But it lacked power: 9.5 hp at 14,000 rpm was not enough, even after the last -minute fitting of a ten-speed box flown from Japan during practice for the TT. Fate decreed that Honda – 125, 250 and 350cc world champion in 1962 – place third in the 50cc class (its biggest world market), with the RC111 of Luigi Taveri finishing behind the Suzuki two-stroke of Ernst Degner and the Kreidler of Anscheidt. Honda dropped out of the 50cc World Championship in 1963. It did not return until 1964, with an extraordinary twin on which Ralph Bryans won the world title in 1965. If it did not enjoy the anticipated success in Grand Prix, the tiny single spawned a sports version, the CR110. Like the 125 CR931, this GP bike was sold with road equipment but retained the racing carburetor and camshafts, plus an 8-speed box for the 50, 6-speed for the 125. These pseudo super sports bikes were put into racing trim to run in the production sports class, where for years they were the favorite mount for privateers. Honda's Grand Prix 50cc racer may not have won the World Championship, but when sold with mad equipment, it dominated the production sports category.